There is only "one" sort of allsorts! RJ's Licorice Allsorts is bursting with delicious flavours. Indulge yourself. You deserve it! Cane Sugar, Glucose Syrup (Wheat, Corn), Water, Wheat Flour, Molasses, Desiccated Coconut, Corn Starch (Wheat, Corn), Liquorice Extract, Treacle, Gelatine, Humectant (E422), Palm Oil, Rice Bran Oil, Acidity regulators (E330, E296), Salt, Aniseed Oil, Colours (E102, E110, E129, E133), Flavours, Vanillin. 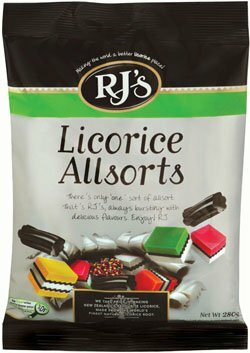 I am a liquorice all sort fiend, and I have tried many different types but R&Js is by far the best out there.